After nearly six years of deflating home prices, the housing market is finally showing some healthy vital signs and is firmly on the path to recovery. For the year ended September 30th, home prices nationwide rose by 4.9%, and the median price for existing homes jumped by almost $14,000 to $185,000, according to Clear Capital, a real estate data and analysis provider. Buyers turned out in greater numbers in 2012, driven by affordable homes and historically low mortgage rates. Strict guidelines for getting a mortgage, however, continue to hinder some would-be buyers’ ability to close the deal. 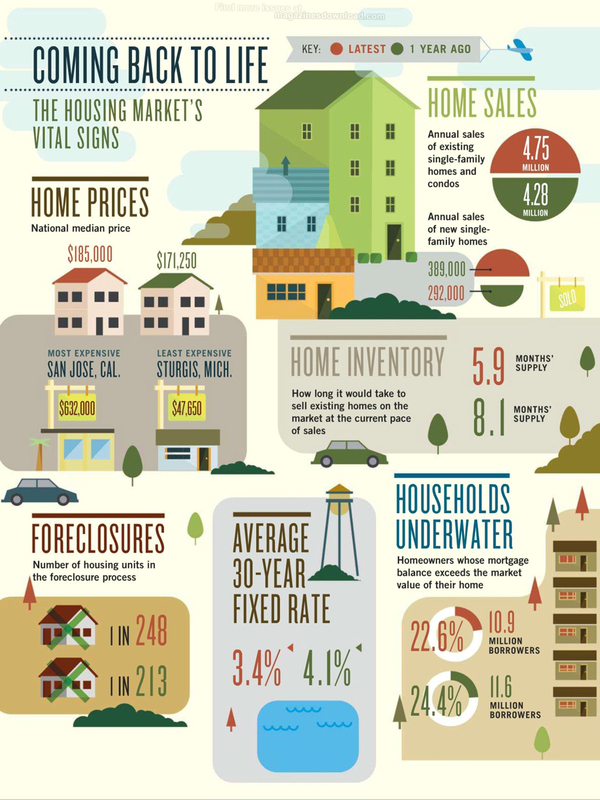 Check out the rest of the housing market’s vital signs in this graphic created with Kiplinger for its magazine’s January 2013 issue.